I've just got back from KL a few hours ago. 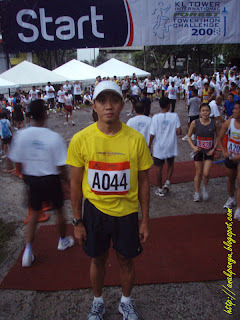 12 hours ago to be exact 8am sunday morning, I've just participated KL Towerthon 2008. How was it? I was expecting for it to be difficult and hard. Instead it was easy. Yes, it was easy!!! My unofficial time was 22.28mins. I could have clocked a better time. I was saving my energy and as a result I wasn't that tired, my legs are not sored and when I reached to the top, I still have a lot of energy. What a waste. Actually, I was being too careful not to waste my energy. The stairs has no indicator what floor level we are in, so I cannot calculate at what floor level should I used my extra energy. The only indicator was the last 4th floor......huuhhhhhh. 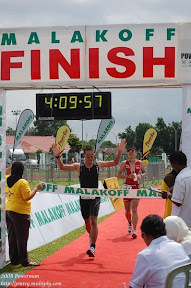 More photos of the KL Towerthon will be posted at a later date.